Thanksgiving is about family and being thankful for what we have. In an effort to thank the planet for being our home and take a load off its back, consider skipping the bird and serving a vegetarian meal this holiday. Studies have shown that producing meat adds more to our carbon footprint than growing and harvesting vegetables. If everyone in the country went vegetarian once a week, it would save the amount of greenhouse gasses produced by some 12 billion gallons of gasoline according to Meatless Mondays. Eating less meat is also good for our health, something worth being thankful for. Studies have shown that eating more plant-based foods lowers the risk of diabetes, heart disease and other diseases. If you'd like to spare a turkey this Thanksgiving, here are four entrée alternatives. If you want an alternative to tofurkey this Thanksgiving, take a look at Veggie Belly's Tofu Skin Roulade with Sage Mushroom Stuffing. The tofu skin, usually found at Asian stores, forms when you simmer a pot of soy milk. The skin is sturdy enough to hold the sage mushroom stuffing and make it through the steaming process. You can even make it the night before and reheat right before dinner. We found this gorgeous dish on The Kitchn. Preheat the oven to 375°F with a rack in the lower-middle position. Slice the squash in half from stem to root and scoop out the seeds. Place the squash halves cut-side-down in a baking dish and pour in enough hot water to fill the pan about 1/4 inch. Cover loosely with foil and place in the oven. Roast until very soft and tender when poked with a fork or paring knife, 30 to 50 minutes. Exact roasting time will depend on the size and variety of your squash. While the squash is roasting, prepare the filling. Cook any raw vegetables and combine all the ingredients in a bowl. Taste and adjust the spices, salt, and pepper to your liking. Flip the cooked squash halves so they form bowls. Rub the inside with a little olive oil and sprinkle with salt and pepper. Divide the filling between the halves — it's fine to really stuff the wells and also to mound the filling on top. Re-cover the pan with the foil and bake the halves for another 15 to 20 minutes until hot and bubbly. Top with extra cheese and serve immediately. Who doesn't love mac 'n cheese no matter what the occasion? This recipe comes from Minimalist Baker. Boil macaroni according to package instructions. In a medium skillet over medium-low heat, sautée the onion and garlic in a bit of olive oil. Season with salt and pepper, stir and cook until soft and fragrant, about 7 minutes. Set aside. Add the onions and garlic to a blender with the remaining ingredients, omitting the tortilla chips and adding only half of the green chilies. Blend until smooth, using the “liquify” setting if you have it. Otherwise blend for up to a minute, scraping down the sides as necessary, until smooth and creamy. 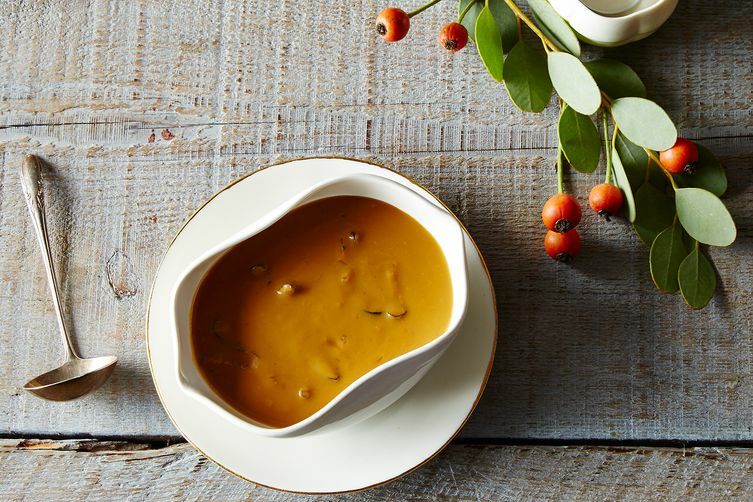 This gravy, via Food52, can dress just about anything on your table. Bring vegetable stock to a boil. In a small bowl pour stock over mushrooms. Let soak for 20 minutes. Remove mushrooms from bowl, setting the stock aside for later. Mince or thinly slice the mushrooms. In a medium saucepan melt the butter. Add the minced shallot and saute for 5 minutes over medium heat until softened. Add the flour to the butter/shallot mixture stirring constantly. Cook for a 2 minutes.